We’d love your help. Let us know what’s wrong with this preview of House of Cards by Michael Dobbs. Mattie Storin is a tenacious young political correspondent. She faces the biggest cha The Number 1 Bestseller that inspired the hit Netflix series starring Kevin Spacey and Robin Wright. To ask other readers questions about House of Cards, please sign up. I love the Netflix series and want to read this book, but I don't want to be spoiled for season 3. Those who have read it and seen the series, am I probably safe reading book 1? Does the Netflix series even follow very closely? It's a good read, but maybe not a great read. If we were allowed half stars it'd be three and a half. More than three for the intriguing concept. But. I'm undecided whether or not to do books two and three. I don't use Netflix so I've yet to see the TV series (have these producers never heard of releasing to DVD before?) but the book is incredible and very deep when it comes to the ruthless nature of politics and the cutthroat atmosphere in the background of it all. With realistic characters and an engrossing plot, House of Cards is a book unlike any other. "Por su propia naturaleza, la ambición necesita víctimas"
Este libro fue concebido con una premisa simple: como deshacerse de un primer ministro. Si bien esto puede realizarse de muchas maneras,y muchas veces ni siquiera que alguien alevosamente mueva los hilos, aquí esto es tejido en pro de satisfacer la ambición y vengar el resentimiento de un miembro del partido, A.K.A. nuestro protagonista, Frank Underwood Urquhart. "La política requiere sacrificios. El sacrificio de los demás, por supuesto "Por su propia naturaleza, la ambición necesita víctimas"
"La política requiere sacrificios. El sacrificio de los demás, por supuesto. No importa qué pueda conseguir un hombre sacrificándose por su país, siempre se saca mayor provecho dejando que otros lo hagan primero. Elegir el momento adecuado, como dice siempre mi esposa, lo es todo. Si bien en el inicio Frank se me figuró un personaje en cierto modo débil, de hecho supongo que la idea del autor era esa demostrar que en la política hasta los individuos más reprimidos son capaces de acciones terribles, pasadas unas páginas notamos como el personaje despliega toda su inventiva con el fin de hundir al primer ministro electo, no obstante no se puede decir que el personaje sea fuerte, más bien su furia lo lleva a iniciar un plan que después, tal como el ha dicho, no puede controlar y que continúa entramando hasta el final más por la necesidad de evitar que él mismo se hunda conforme la historia avanza. "La política dejaba una estela de dolor y familias atormentadas a su paso"
"Los políticos se parecen mucho a los escritores avejentados y las mujeres ancianas. La fase más peligrosa en sus vidastienen lugar cuando ya no se contentan con el respeto de los amigos y exigen la adulación de un público"
No puedo decir que la trama sea una joya, pero la manera en que se maneja es bastante funcional y logra que, conforme los planes de Urquhart van cumpliendo los objetivos, la historia entretenga y honestamente entres en el deseo de que descubran a Frank y al mismo tiempo de que no lo hagan. Toda la putrefacción que puede haber en el mundo de la política esta depositada en Frank pero, esta versión del personaje que de hecho es la original no siento que logre sostener por si mismo la historia. Todella viihdyttävä poliittinen valtapeli, jossa ei keinoja kaihdeta päämäärien saavuttamiseksi. Sanon nyt suoraan, että jos ei ole lainkaan kiinnostunut politiikasta (tai lähinnä siitä suljettujen ovien takaisesta, yleisöltä salassa pidetystä touhusta) niin tämä kirja ei ole sinulle. Mutta jos haluat päästä sisään Britannian parlamenttiin ja päästä lukemaan asiantuntemuksella kirjoitettua tekstiä niin kyllä, lue tämä. Jännää miten aloitettuani tämän kirjan en yhtään osannut nähdä Kevin Spaceytä F Todella viihdyttävä poliittinen valtapeli, jossa ei keinoja kaihdeta päämäärien saavuttamiseksi. Jännää miten aloitettuani tämän kirjan en yhtään osannut nähdä Kevin Spaceytä Francis Urquhartina (tai Frank Underwoodina kuten tv-sarjassa hänen nimensä on), mutta kun olen nyt about kahdeksan jaksoa sarjaa katsonut en osaa nähdä enää muuta kuin Spaceyn kasvot. If you are looking for the most sensational political thriller.. look no further! I had high expectations for Michael Dobbs' "House of Cards" after becoming addicted to the American Netflix version and I must say, I was not disappointed. I thought it would be hard to beat the series starring the brilliant Kevin Spacey... but beaten to a pulp it was! I had heard of the BBC mini-series based on these books before but never got around to watching them, it was only after discovering the American version that I decided to give the books a try. Being British and highly interested in politics I'm surprised I didn't discover these sooner. Francis Urquhart is the Chief Whip for the British government. For those who don't know British politics overly well he is responsible for knowing everything (and I mean everything) about all the government's Member's of Parliament including cabinet ministers. Although this role is vital to the newly elected Prime Minister, Henry Collingridge, it is a background role and doesn't come with the glamour of a more senior minister. Is Urquhart happy with his role? Maybe. Does he have higher ambitions? Absolutely! It is with these ambitions that I found myself questioning my own moral judgement. Collingridge isn't a bad man but is by no means a strong man either! Should this go against him? After all, he holds the most powerful political office in the country. It is with this I found myself internally cheering for Urquhart.. even with suspense novels you can see the which outcome is likely to occur. The way in which Urquhart goes along his business is almost beyond belief, with the ruthlessness of an African dictator but the subtlety of a KGB spy... Not bad for a 62 year old MP. Urquhart does however catch the attention of Mattie Storin, a political reporter for The Chronicle, not least because he welcomes the attention. Scandal, defeat, triumph and greed all feature in this book and makes it the thriller and namesake it deserves to be. Even if you don't overly follow politics you will get enjoyment out of this book, the background is explained without needing vast knowledge... For those of you who do follow politics, this is a must read!! The historical background mixed with the political fiction is outstanding. This is gonna be an interesting review. And probably as complex as that book and my feelings while reading it. I wouldn't say political thrillers are my cup of tea. I was never really interested in politics and how a country should be handled but 1) I was in mood for something corrupted and 2) my brother (who by the way is into politics) asked me to read it and tell him my opinion. I still don't know how I feel about it anyways. Did I like some things? Oh yes. Did I dislike some others? Obviously. Let's do it! The writing style was rich but also simple. It was changing from poetic to tough very quickly, along with the mood of the characters and totally matched the shade of the book and the plot. It was a big thumbs up for me and especially the quotes in the start of every chapter made me get even more excited for what was going to happen. The plot twists were absolutely mind blowing and the way everyone was falling under Urquhart's feet for the sake of power was making me more eager to turn the pages one by one, devouring the book bit by bit. Too bad most of the characters had very bad surprises upon their way. What was a big thumbs down for me, though, was the characters. Let me tell you. The way they were built, full of secrets and dark desires, was perfect for a political thriller. The thing is, though, that due to their behavior and want to fulfill their purposes without to care for the rest made me hate them all. I found myself indifferent even for the characters that were supposed to be liked. Francis was probably the character I hated the most, although he is an amazing protagonist for a book like that. I just feel annoyed when I cannot connect with the characters at all, since they play a very important role to my opinion about a book and I was actually sad there was not a single character to like. I did love to hate a lot of them though. Mostly Francis but also Benjamin and some more. The way they were moving the strings of their puppets to lead themselves to their ultimate purpose was both frightening AND fascinating. Another let down was the way women were treated. I liked the fact that one of the main characters was a strong woman that was willing to uncover a ground breaking mystery but other than that, I could see a lot of sexist vibes and that disturbed me. This opening book of the trilogy lays the groundwork for what looks to be a sensational British political series, centred on one Member of Parliament and his addiction to power, no matter the cost. The book opens after the latest general election, as cabinet posts are being mulled over, and certain people, sure to be getting something are left out in the dark. Cue the beginning of the end for those holding the reins of power. 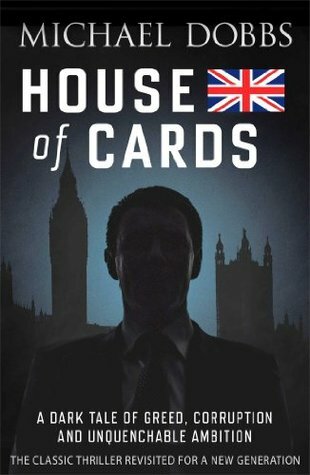 Any reader of this genre may see some of the Jeffrey Archer influences This opening book of the trilogy lays the groundwork for what looks to be a sensational British political series, centred on one Member of Parliament and his addiction to power, no matter the cost. The book opens after the latest general election, as cabinet posts are being mulled over, and certain people, sure to be getting something are left out in the dark. Cue the beginning of the end for those holding the reins of power. Any reader of this genre may see some of the Jeffrey Archer influences in the book, especially in FIRST AMONG EQUALS, though in this case it is one man seeking power, not a handful. The reader will also see the lengths to which a report will go to obtain the scoop of her lifetime and how she will handle the world of man-dominated reporters. In what can only be described as a true ascent to power of both characters, Dobbs sets the scene for some explosive action in the books that follow and will surely have readers on the edge of their seats. I can admit an addiction to the Netflix-based Americanisation of this novel and how intriguing it was. I have yet to see the BBC series and will once the trilogy is complete. That said, the two different forms of government (parliamentary versus presidential) is not the only means by which this book and that series differ. The intrinsic nature of the British parliamentary system is a perfect backdrop for the book and will certainly come to play an even greater role and the second and third books present more information and drama. I can only hope that the books pull me in as Ralph Reed’s trilogy did, based on a US election and subsequent ascent to power. Anyone with a passion for politics (and especially a love of the parliamentary system) will thoroughly enjoy this political drama. Dobbs is to be applauded for his work and I cannot wait to see what he has in store next. Kudos Mr. Dobbs… you have the golden touch. Keep it up and dazzle us readers some more! I've long been a fan of the original BBC series based on this book and have always meant to read it, so with my son nagging me to hurry up and watch the new US series I thought it was time to finally get around to reading the book that started it all. Very glad I did. Well worth the read. Also makes me appreciate the full extent of what Andrew Davies so cleverly did with the original series. Love it!! Am now eagerly awaiting the next two books in the trilogy :). Ένα συναρπαστικό πολιτικό θρίλερ! Δεν θα απογοητεύσει κανέναν. Empecé a leer este libro, como seguro muchos otros, por la serie de Netflix. Increíble; increíble también la interpretación de Kevin Spacey, e increíbles también los IWC que con tanta elegancia porta el tío. Y hasta aquí las menciones a la serie. Este libro no está basado en la política estadounidense sino en la política británica. Michael Dobbs lo escribió, de hecho, cuando dejó de ser jefe de gabinete de Margaret Thatcher; cabe pensar cómo trataría a sus compañeros la Dama de Hierro, para que e Empecé a leer este libro, como seguro muchos otros, por la serie de Netflix. Increíble; increíble también la interpretación de Kevin Spacey, e increíbles también los IWC que con tanta elegancia porta el tío. Y hasta aquí las menciones a la serie. Este libro no está basado en la política estadounidense sino en la política británica. Michael Dobbs lo escribió, de hecho, cuando dejó de ser jefe de gabinete de Margaret Thatcher; cabe pensar cómo trataría a sus compañeros la Dama de Hierro, para que el pobre tuviera tanta rabia acumulada para pasársele por la cabeza esta historia. Dobbs recoge en este libro lo peor de la política en la figura de Francis Urquhart. La trama es similar a la que todos hemos podido ver en la serie, con la salvedad del escenario, del cambio de política y del pensamiento y humor inglés del autor de la novela; lo que hace que pese haber visto la serie de Netflix puedas disfrutar también del libro. Urquhart es tremendamente bueno en lo que hace; es el típico político con el que puedes disfrutar viendo cómo se maneja entre el nido de ratas de forman tanto él como el resto de políticos, nido del cual tiene que ser el peor para que el resto le tengan el respeto que precisa si no quiere ser acribillado por cualquiera de sus «colegas»; es el prototipo perfecto de político que bajo ningún concepto querrías que gobernara en tu país o ciudad… pero a la vez, por todo lo anteriormente expuesto, es quien más posibilidades tiene de ser elegido. Porque no dudará un instante en llevarse por delante a quien haga falta con tal de hacer realidad sus aspiraciones. El inicio es un poco lento, y puede llegar a parecer incluso que nos enfrentamos a una lectura tediosa, pero conforme Urquhart empieza a «soltarse» las cosas van sucediendo una tras otra y siempre quieres saber cuál será su próximo paso, por lo que al final logra enganchar y terminar el libro muy rápido. I will start right out by saying that while I have seen advertisements for the show "House of Cards", I have never actually seen the show. This is an honest review of the book, not a comparison between the book and the show. Now that is out of the way, let's talk about the book. I found this book to be extremely dull and uneventful. I definitely do not believe that this book should be classified as mystery/thriller, more like plain literary fiction. The plot is slow from the start. While there are some interesting parts dealing in political sabotage, there isn't much excitement throughout the entire story. The story is slow moving, dealing more in the interactions of characters than in any excitement or action. While I am normally a fan of strong character-driven plots, that style just didn't work for this book. The characters in this book were part of the reason why I felt that the character-driven plot didn't work. All of the characters in this book seemed incredibly unlikable and difficult to relate to. Even the characters that it seemed like the reader was supposed to like, weren't easy to like and were much easier to dislike. I found all the characters acted in an extremely superficial and fake manner, making them difficult to enjoy and believe in. The writing in this book was also insufferable. The author writes in a manner that, while seemingly sophisticated, is confusing and challenging to follow. I had a hard time keeping everything straight in this book- who all the characters were, who had done what, etc. Normally I don't have a problem following even the most confusing of story-lines, but this book posed a serious challenge to me. I also found that the author wasn't very descriptive; he writes in a manner that is almost too straightforward and factual for a fiction book. The final issue that I had with this book is the understanding of politics. I live in the United States and while I feel that I have a solid grasp on the way our political system works, the political system of England is another matter entirely. This book is completely about the government, so if you don't have a solid political understanding, this book is a challenge to follow and read. Honestly, I had been hoping that after reading this book I would want to watch and enjoy the show. In reality, after reading this book I will definitely not be watching the show for fear that it will be as bad as the book. It reminded me a lot of the pre-Watergate Washington novels I read when I was a kid, like Advise and Consent or The President's Plane Is Missing. “That’s not fair…” she protested. …where all the best parliamentary secrets are stored to away Judgment Day, or some other parliamentary emergency. After sitting down and watching the adaptations of this novel on Netflix with Kevin Spacey in the lead role, I was hooked. I decided to read the original novels, and I was fascinated at how the character of Francis Urquhart came about. Set in the late 80's, FU is the Chief Whip for the majority party, and after the Prime Minister manages to hang onto his job, FU is expecting a sweet plum of a Cabinet position to fall into his lap. But he is passed over and FU vows a bloody revenge on the Prime M After sitting down and watching the adaptations of this novel on Netflix with Kevin Spacey in the lead role, I was hooked. I decided to read the original novels, and I was fascinated at how the character of Francis Urquhart came about. Set in the late 80's, FU is the Chief Whip for the majority party, and after the Prime Minister manages to hang onto his job, FU is expecting a sweet plum of a Cabinet position to fall into his lap. But he is passed over and FU vows a bloody revenge on the Prime Minister -- and this novel reveals the convoluted tail of ambition, power and sheer wickedness. If you've only seen the Netflix series (and if you haven't, you should) rest assured that this won't ruin anything. I found it to be an intriguing intersection with the series, and only whetted my appetite to read the rest of the series, and hoped that there will be a third season on Netflix to come. Four and a half stars, and very much recommended. Към края ми стана доста по-интересна, но като цяло Играта на тронове в Британския парламент ми беше твърде суховата..
Ho deciso di leggere questo libro dopo essermi appassionato alla serie televisiva e aver scoperto che in origine le vicende non si svolgevano in America (e nel presente) quanto in Inghilterra, e ormai un bel po’ di anni fa. Il cambio di location ovviamente imponeva un’enorme quantità di modifiche: il sistema elettorale, il ruolo aspirato, i finanziatori, le politiche… tutto diverso. Ho scoperto così la storia di Francis Urquhart, chief whip dei conservatori. Una storia per certi versi simile a quel Ho deciso di leggere questo libro dopo essermi appassionato alla serie televisiva e aver scoperto che in origine le vicende non si svolgevano in America (e nel presente) quanto in Inghilterra, e ormai un bel po’ di anni fa. Una storia per certi versi simile a quella di Frank Underwood (ambizione, assenza di scrupoli, certi punti in comune nelle vicende dei due) ma per altri parecchio diversa. Francis, rispetto a Frank, è meno geniale, meno forte. Si sente profondamente ferito quando, dopo le elezioni, non ottiene il ruolo cui aspirava e quasi si umilia con il Primo Ministro. E anche quando mette in moto le macchinazioni che porteranno alla sua caduta, lo fa per vendicarsi di quell’umiliazione. Stupendosi di esserci riuscito. Non è che quando i giochi sono ormai fatti, che finalmente capisce cosa ha realmente ottenuto e decide di puntare al vertice. E’ molto diversa anche la moglie, Mortima, rispetto alla Claire della tv. Mortima ha interessi personali ma non è una donna in carriera con le sue attività da mandare avanti, si piega alle necessità del marito ma non è sua pari in tutto, eccessi compresi. Sopratutto, è diverso il nemico, l’avversario da abbattere. Il Presidente Americano è appena stato eletto, è saldissimo al potere e serviranno due stagioni a un Frank Underwood deciso e privo di morale a spodestarlo. Il Primo Ministro invece è una figura debole e quasi paterna, proposta anni addietro come successore della Tatcher per allontanare il partito dalla figura intransigente e forte di lei. Un Primo Ministro più accondiscendente e pacifico, che però giunto al record del suo terzo mandato ha una maggioranza risicata e governa un partito in sommossa dopo i risultati deludenti delle elezioni appena vinte. La ragnatela di eventi che Francis metterà in moto per sfiduciare il Primo Ministro prima e farsi eleggere poi è degna della serie tv, tra ricatti impliciti ed espliciti, truffe, contraffazioni e rilascio di informazioni riservate. E anche qui ci saranno un paio di vittime immolate sull’altare del potere. Pure qui si tratterà di una persona affetta da dipendenze delle quali Francis approfitterà biecamente, e di una giovane giornalista che avrà instaurato un rapporto con lui (benché in questo caso lei si dichiareri addirittura innamorata del politico). Insomma, la trama è avvincente e più rapida che non nella serie televisiva. La storia è ottima, e questo pur conoscendo la serie e quindi sapendo bene o male cosa sarebbe dovuto succedere. Ottima anche la scrittura, all’inizio abbiamo poi una metafora del potere politico con la falena e le lampade che ritengo splendida. Gli unici difetti che ho trovato nel libro sono che Francis appare meno dirompente, come personaggio, rispetto a Frank Underwood (ma questo può essere dovuto alla diversità del media utilizzato e all’interpretazione magistrale di Kevin Spacey), e il fatto che nei primi capitoli l’attenzione si sposta da un personaggio all’altro come a darci un quadro generale della situazione prima di partire con la trama vera e propria, generando però un po’ di confusione. Στις περισσότερες (αν όχι όλες) των περιπτώσεων, δε μπορώ να διαβάσω ένα βιβλίο αν έχω δει την ταινία ή τη σειρά που έχουν προέλθει από αυτό. Το ίδιο ισχύει και με το House of Cards το οποίο το ξεκίνησα ξέροντας μόνο ότι έχει να κάνει με πλεκτάνες μέσα στο Βρετανικό Κοινοβούλιο, και πράγματι έτσι είναι. Εδώ να αναφερθεί ότι ο Michael Dobbs ήταν επί χρόνια βοηθός της Margaret Thatcher (φτου) αλλά και του διαδόχου της John Major. Μπορούμε, κρατώντας μια πισινή, να υποθέσουμε ότι πολλά από αυτά που Στις περισσότερες (αν όχι όλες) των περιπτώσεων, δε μπορώ να διαβάσω ένα βιβλίο αν έχω δει την ταινία ή τη σειρά που έχουν προέλθει από αυτό. Το ίδιο ισχύει και με το House of Cards το οποίο το ξεκίνησα ξέροντας μόνο ότι έχει να κάνει με πλεκτάνες μέσα στο Βρετανικό Κοινοβούλιο, και πράγματι έτσι είναι. Εδώ να αναφερθεί ότι ο Michael Dobbs ήταν επί χρόνια βοηθός της Margaret Thatcher (φτου) αλλά και του διαδόχου της John Major. Μπορούμε, κρατώντας μια πισινή, να υποθέσουμε ότι πολλά από αυτά που γράφονται στο βιβλίο έχουν συμβεί, και αν όχι έτσι σε παρόμοιες εκδοχές. Αλλά και να μην ξέραμε ποιος είναι ο συγγραφέας, πάλι πολλά από αυτά τα υποθέτουμε βλέποντας την πολιτική ζωή της κάθε χώρας. Ακόμα και της ψωροκώσταινας. Στα της ιστορίας, η γραφή είναι πολύ καλή και κρατάει τον αναγνώστη και τα ονόματα που αναφέρονται είναι όσα πρέπει ώστε να μην χάνονται. Υπήρχαν κάποια κενά που βοηθούσαν την πλοκή να πάει εκεί που ήθελε ο συγγραφέας αλλά δεν ενοχλούσαν ιδιαίτερα. Κάτι που απόλαυσα επίσης ιδιαιτέρως είναι τα αποφεύγματα του Francis Urquhart στην αρχή του κάθε κεφαλαίου. But I couldn't possibly comment! Προσπάθησα πάρα πολύ να διαχωρίσω το βιβλίο από τη σειρά, την ίδια στιγμή που δεν έπρεπε να το κάνω, καθώς η σειρά δε βασίζεται απλώς στο βιβλίο αλλά γεννήθηκε από αυτό. Ωστόσο είχα συνηθίσει το αμερικάνικο πολιτικό σύστημα. Σε κάθε περίπτωση πρόκειται για ένα εξαιρετικά καλογραμμένο βιβλίο, μια απίστευτη ιστορία με επίκεντρο τον λατρεμένο Φράνσις. This was a highly entertaining political thriller. I loved following the journalist Mattie as she tries to understand what is going on. I also enjoyed "chief whip" Francis Urquhart machinations to get to power. Irreverent and fun. Makes me wonder about real life politics! One of the best political thrillers I have read ... The games, the characters and the intrigue - all just perfectly weaved to make it a fast and gripping read!! I really enjoyed this book but it left me feeling somewhat depressed as it hammers home that the Government is an absolute shambles, full of self serving power hungry wankers. Nothing in this story is unbelievable and it bloody well should be! But it wouldn't surprise me if something like this came out of Parliament. We almost expect politicians to act like this now, that it's hardly shocking when a scandal rears its ugly head. I wish they'd just put their differences aside and get on with the I really enjoyed this book but it left me feeling somewhat depressed as it hammers home that the Government is an absolute shambles, full of self serving power hungry wankers. Nothing in this story is unbelievable and it bloody well should be! But it wouldn't surprise me if something like this came out of Parliament. We almost expect politicians to act like this now, that it's hardly shocking when a scandal rears its ugly head. I wish they'd just put their differences aside and get on with the job of running the country. Романът е опростен като сюжет и поне за мен предвидим като край, но точно така и трябваше да завърши, всичко друго би било половинчато и безгръбначно. Хареса ми това затягане на напрежението, това изплитане на мрежата, това поставяне на капани, щракването им, оставянето на жертвите да прегризат сами крайниците си и примирени да се оттеглят от сцената на борбата. Разбира се, допадна ми силната критика към политическата система, която толерира пасивни и безобидни плужеци, която в самата си същност насърчава лицемерието и лъжата, прикриването на страстите, на греховете, на нуждата всяка дребна простъпка да бъде заметена под килима и по този начин да направи извършилия я подчинен на някой, който знае за нея. Медиите са важни по тия страници – техните собственици, редактори и репортери, балансът между дълг и умение за нагаждане, симбиозата с политическата класа, но и нуждата все пак да я жилят от време на време. Добс поставя важни въпроси с ясни отговори – но няма да откриете рецепта за измъкване от създалата се биосистема на взаимно подхранване. Me entretuvo bastante, aunque no tanto, como la serie. En efecto, fue la serie protagonizada por Kevin spacey (no he tenido el chance de ver la británica) la que me llevó a leer la novela que la inspiró. Y sí, el espiritú de FU (Frank Urquhart en la novela, Frank Underwood en la serie) es el mismo, aunque la personalidad de Spacey, y la modernización de la trama, hacen más formidable al personaje de la pantalla. Para quienes no conocen la trama: El Primer Ministro es reelegido. El Whip de su parti Me entretuvo bastante, aunque no tanto, como la serie. Para quienes no conocen la trama: El Primer Ministro es reelegido. El Whip de su partido (un puesto político que se encarga de asegurar los votos de los miembros del Senado) anhela una mejor posición, de hecho la espera por servicios prestados, sin embargo es relegado. Por lo tanto decide vengarse, y nada menos que derrocando al Primer Ministro y ocupar su lugar. Y lo que sigue es una serie de manipulaciones e intrigas, que muestran cómo derrocar a un Primer Ministro, o a cualquier político, si se tiene la información y las agallas suficientes. Algunos de los escenarios son poco creibles, y hay otros brillantes. En general tiene un excelente ritmo, FU es todo un personaje, aunque los secundarios no están tan desarrollados como debiéran. I thought it was okay. I don't think I was totally enamored with it, but it was something nice to read and since I watched 4 seasons of the Netflix series, it was interesting to see parallels. I can definitely see the basis for some of the Netflix characters. All in all, not bad, it had the appropriate amount of backstabbing, runaround, and general politickiness (new word!) one would expect from an election year. Ούτε αστέρι δεν θα βάλω αν μπορώ, μου είναι εντελώς ακατανόητο. Μέχρι εδώ που έφτασα μιλάει για τις εκλογές στην Αγγλία, για τον τρόπο που λειτουργεί η βουλή τους, για τις ατιμίες των πολιτικών κα ιτις σχέσεις τους με τους δημοσιογράφους. Ένα μικρό σχόλιο για το φιάσκο της έκτης σεζόν της σειράς του Netflix. Οποιαδήποτε ομοιότητα με το βιβλίο του Dobbs είναι εντελώς συμπτωματική, καθότι δεν το έχω διαβάσει και μάλλον δε θα το κάνω κιόλας. N-am să descriu cartea prin adjective siropoase de genul "superbă", "minunată" etc deoarece scrierea se ridică mult deasupra acestora, în primul rând, iar în al doilea, acestor termeni nu le văd locul lângă o carte cu un nucleu central nemilos, crud, şocant: lupta pentru putere. Inițial cartea pare o banală înşiruire de evenimente obişnuite de pe scena politică, însă pe măsură ce acțiunea îşi urmează cursul, lucrurile se complică, situația devine presantă şi întâmplări tot mai terifiante se deru N-am să descriu cartea prin adjective siropoase de genul "superbă", "minunată" etc deoarece scrierea se ridică mult deasupra acestora, în primul rând, iar în al doilea, acestor termeni nu le văd locul lângă o carte cu un nucleu central nemilos, crud, şocant: lupta pentru putere. Inițial cartea pare o banală înşiruire de evenimente obişnuite de pe scena politică, însă pe măsură ce acțiunea îşi urmează cursul, lucrurile se complică, situația devine presantă şi întâmplări tot mai terifiante se derulează în fața cititorului! În lupta pentru putere se găsesc fie oameni cruzi, fără scrupule şi extrem de calculați dar care rămân umili în umbră (Francis Urquhart), fie oameni slabi de înger care încearcă să ofere iluzia de încredere de sine şi putere absolută dar care pot fi trimişi la pământ (sau sub pământ, în unele cazuri) la fel de uşor ca un castel din cărți de joc. Myślę, że wielu serialomaniaków zna i uwielbia rewelacyjny serial „House of Cards” ze znakomitym Kevinem Spacey’em. Fenomen tego serialu pokazał, że polityka wcale nie musi być nudna a pojedynki słowne między przedstawicielami władzy potrafią być równie interesujące i zajmujące jak komercyjne widowiska Hollywoodu. Niewielu jednak pamięta, że serial ten to w rzeczywistości remake, nowa wersja brytyjskiej miniserii z lat 90-tych (mimo wszystko ciut lepszej od swego następcy). Jeszcze mniej osób wi Myślę, że wielu serialomaniaków zna i uwielbia rewelacyjny serial „House of Cards” ze znakomitym Kevinem Spacey’em. Fenomen tego serialu pokazał, że polityka wcale nie musi być nudna a pojedynki słowne między przedstawicielami władzy potrafią być równie interesujące i zajmujące jak komercyjne widowiska Hollywoodu. Niewielu jednak pamięta, że serial ten to w rzeczywistości remake, nowa wersja brytyjskiej miniserii z lat 90-tych (mimo wszystko ciut lepszej od swego następcy). Jeszcze mniej osób wie, że ów serial był adaptacją książek brytyjskiego polityka, który po ich sukcesie w Wielkiej Brytanii, poświęcił się zawodowo pisarstwu. Miałem przyjemność oglądać obie wersje tej opowieści i obie, będąc miłośnikiem pojedynków psychologicznych, uwielbiam. Gdy amerykańska wersja stała się fenomenem na skale światową wiedziałem, że to kwestia czasu, gdy ktoś w Polsce wyda cała trylogię. Omawiana przeze mnie pierwsza część była już obecna w Polsce od wielu lat, ale chyba nie odniosła sukcesu, bo kolejnych już nie wydawano. Odłożyłem ją, więc na bok czekając aż ktoś zwęszy zarobek i wyda całość. I rzeczywiście wydawnictwo Znak wznowiło książkę, a dosłownie tydzień temu wydało kolejną część. Raczej już wiadomo, że wydanie finału to formalność, więc zaopatrzyłem się w dotychczas wydane tomy i zabrałem się do lektury pierwszego z nich. Jestem pewny, że ci, którzy spojrzą na okładkę książki, będą pewnie myśleć, że jest to opowieść o Franku Underwoodzie. Nic bardziej mylnego, Bohaterem książkowego „Domku z Kart” jest Francis Urquhart, 65-letni rzecznik dyscypliny partyjnej w brytyjskim rządzie, czyli, krótko mówiąc człowiek działający za kulisami, osoba pilnująca by posłowie głosowali zgodnie z oficjalnym stanowiskiem Partii i jednocześnie swego rodzaju sprzątacz, który zajmuje się tuszowaniem i ukrywaniem różnych występków i przewinień polityków. Francis to z pozoru miły, stonowany staruszek, lojalny i bezgranicznie oddany swojej pracy i Partii. W rzeczywistości jednak to człowiek bezwzględny, cyniczny, całkowicie pozbawiony zasad i sumienia, nieszanujący nikogo oprócz siebie, mający wielkie ambicje i ogromny apetyt na władzę. Kiedy jego partii z trudem udaje się, wygrać kolejne wybory, Francis ma nadzieję na realne miejsce w gabinecie, niestety szybko zostaje sprowadzony na ziemie przez urzędującego Premiera. Udając obojętność przygotowuje zemstę, która zniszczy jego wrogów, a jego samego wyniesie na fotel najważniejszej osoby w państwie. Osobiście mnie książka bardzo wciągnęła, mimo, że znałem już cała historie z serialu. Dobbs ciekawie portretuje środowisko polityczne Wielkiej Brytanii pokazując skorumpowany świat ludzi sprawujących władzę w państwie, jednocześnie formuje bohatera na tyle chytrego i nieprzebierającego w środkach, że temu udaje się dosłownie wśliznąć na fotel Premiera niszcząc swoich oponentów, jednego za drugim, cały czas udając ich przyjaciela i zaufanego współpracownika. Francis po trupach swoich kolegów dąży do władzy i szacunku, który wg jego mniemania, po prostu mu się należy i śledzenie losów jego i reszty postaci, jest fascynujące, ale i trochę przerażające. Smutny jest trochę ten obraz wyłaniający się z kart powieści. Według Dobbsa, politycy to zgraja ludzi z różnymi ambicjami, przywarami i słabościami, często wykorzystywanymi przez ich przeciwników, którzy ciągle coś udają oraz poświęcają dla polityki prawie wszystko, płacąc za to sporą cenę. W całej tej historii jest pewna uniwersalność, bo przecież książka ta powstała ponad 25 lat temu, a niewiele straciła ze swej aktualności. I chyba to się nie zmieni, bo polityka zawsze będzie się rządzić pewnymi mechanizmami i prawami, które zostały tu tak ciekawie zobrazowane. Jednak czytelnicy, którzy sięgną po tą książkę, bo oglądali amerykańską wersję, bądź tylko o niej słyszeli, mogą się poczuć zawiedzeni. Czytając tą powieść, trzeba jednak posiadać, choć minimalną wiedzę o brytyjskiej władzy wykonawczej by się nią cieszyć. Ja liznąłem trochę wiedzy z serialu, więc było mi łatwiej zrozumieć pewne niuanse, a przede wszystkim stanowiska w rządzie tak różne od tych sprawowanych w Polsce czy USA. Rozumiem, więc najzupełniej, czemu książka zbiera tak różne opinie. Dla kogoś, kto nie przepada za politycznymi opowieściami, książka może się dłużyć a nawet wydać mu się nudna. Nie ma tu dynamicznej akcji, (choć to już kwestia gustu, według mnie akcji jest tam całkiem sporo, tylko nie takiej jak w powieściach sensacyjnych), opowieść zmierza w jednym przewidywalnym kierunku, brak narracji w pierwszej osobie i swoista rozmowa z widzem, jak to miało miejsce w obu serialowych wersjach, stanowi spory minus, z drugiej strony zyskujemy dostęp do myśli i wspomnień bohaterów. Pozwoliło mi to spojrzeć na nich, z nieco innej strony. Postacie, które w serialu, uznałem z mało interesujące, w powieści nabrały nowego wymiaru. Już nie mogę się doczekać, co się będzie działo w kolejnych tomach. Komu więc warto tę książkę polecić ? Chyba tylko osobom lubiącym gatunek political fiction, lubiącym subtelne thrillery, z naciskiem na rys psychologiczny postaci. Ostatecznie, każdy powinien sprawdzić i zobaczyć jak odbierze tą powieść. Według mnie jest świetna.